There has been dramatic growth in the number of immersion programs during the last decade. More and more communities have chosen to support this educational option, whose benefits to students are well documented. In this feature we spotlight immersion schools and explore factors that make each one unique. As the laboratory school of the state’s Hawaiian Language College, Nawahi has a special role in the development of public education through Hawaiian. 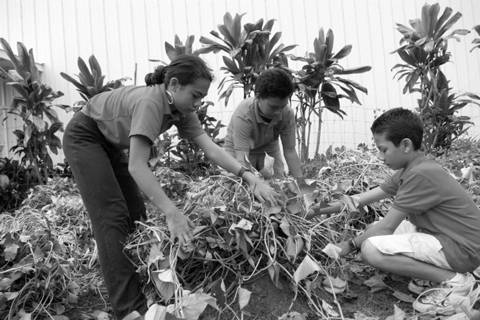 Its unique ten-acre school site, provided by the state Office of Hawaiian Affairs, includes gardens of traditional Hawaiian crops such as taro, sweet potatoes and breadfruit. In these gardens students connect to traditional Hawaiian practices and the natural environment that has nurtured their culture for generations. Through classes taken at the Hawaiian Language College3 and through interaction with student teachers, Nawahi students connect to the College’s Hawaiian language medium B.A., M.A., teacher certification, and Ph.D. programs, all of which are taught through Hawaiian. Thus, Nawahi is part of a P-20 system of environmentally-oriented Hawaiian language education created over the past twenty-five years. The focus of Nawahi on language revitalization provides direction for its entire program beginning with a small infant toddler program serving children raised from birth as first language speakers of Hawaiian. These unique children provide an important core around which to build larger Hawaiian- speaking peer groups. At age three children of parents who are highly committed to learning Hawaiian join those matriculating from Nawahi’s infant toddler program into the local Punana Leo preschool. This preschool is part of a statewide system of eleven such schools with an 8-hour day, 5-day week, 11-month program taught entirely through Hawaiian. The Punana Leo educational program was developed in its early years through a combination of the teachings of fluent elder Hawaiian speakers and concepts adapted from English medium preschools. There is a strong focus on Hawaiian music, traditions, and community values. Parents are required to attend weekly language classes and monthly meetings. Nawahi students tend to the school garden. At kindergarten, Punana Leo preschool graduates are joined by a new group of non-Hawaiian speaking students. Children enter at later grades under special circumstances such as transfer from another public Hawaiian medium school or demonstrated strong family motivation. From kindergarten through grade six Nawahi is run as a fully Hawaiian medium public charter. English is introduced at grade 5 as a one-hour language arts course directly parallel to the English language arts courses followed in state English medium schools. At seventh grade additional students enter Nawahi from Ka ‘Umeke Ka‘eo, another Hawaiian language public charter school. The intermediate and high school program is college preparatory and administered separately under the standard public school district of the island. English is the language of instruction for English language arts, while all other courses are taught through Hawaiian but with use of both English and Hawaiian language reference materials. The student population at Nawahi is approximately 70% free and reduced lunch. Annually, over 95% of the students are Native Hawaiian, a population which in other schools has a higher than state average drop out rate and lower than state average academic performance. Since its initial graduating class in 1999, Nawahi has had 100% high school graduation and 80% college attendance. This past year a Nawahi student graduated from Stanford, while another continued in his doctoral program at Oxford. During the past two summers, Nawahi high school students were enrolled in summer programs at Harvard, Stanford and Columbia universities. A high percentage of Nawahi students also participate in athletics and a number have won state awards, including awards for English writing. Nawahi is a leader in the state in applying indigenous Hawaiian values in classroom management and academic perspectives. In the past few years it has given special attention to modernization of the syllabic hakalama reading system used in 19th century Hawaiian language medium schools. This system has proven highly successful allowing serious reading instruction to begin at age four and paving the way for earlier transition from decoding to reading comprehension. Hawaiian uses the Roman alphabet, which helps many Nawahi children read English as well as their peers in English medium schools even before English is formally introduced at Nawahi. 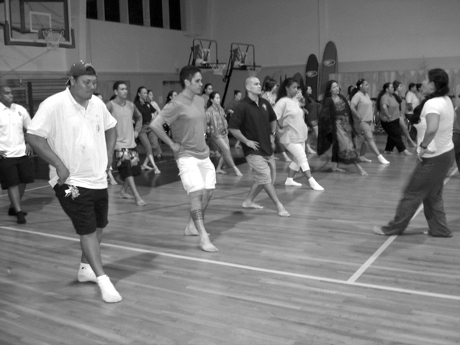 During a weekly language and culture class, parents of Nawahi students learn traditional Hawaiian dancing. As Hawaiian has grown stronger at Nawahi, the school has introduced a heritage language program. Native Hawaiian children typically have ancestors from several racial strains who migrated to Hawai‘i to work on early sugar plantations. The largest such immigrant ancestries of Nawahi students are East Asian. In order to honor those ancestors, all first to sixth grade students study the Japanese kanji used traditionally to write East Asian languages but read them with Hawaiian language values. Syllabic adaptations of these characters based on the hakalama system allow the students to read and write anything in Hawaiian using a basic set of characters.4 Weekly one-hour study of Japanese kanji is complemented with one hour of oral Japanese language study required at the same grade levels and optional study of Mandarin Chinese after school. Also common among the ancestors of students at Nawahi are Portuguese, Puerto Ricans, and Hispanicized Filipinos. To honor these ancestors, all students from grade 7 through 10 study Latin one hour a week.The study of Latin also provides a means to further strengthen student understanding of Hawaiian and English grammatical structures and vocabulary. While Nawahi continues to grow academically, its first priority is the long-range survival of Hawaiian. It is this language revitalization purpose that distinguishes Nawahi from standard one-way total immersion and two-way bilingual immersion programs. Thus, the true measure of Nawahi’s success is the choice of Hawaiian by growing numbers of its graduates as the language to transmit to their own children as their mother tongue. 2. The state’s K-12 Hawaiian immersion programming can be viewed at www.k12.hi.us/~kaiapuni. 3. Visit the state’s Hawaiian language medium college at www.olelo.hawaii.edu. 4. An English explanation of the use of Japanese kanji to teach Hawaiian literacy at Nawahi can be viewed on the ‘Aha Punana Leo website, www.ahapunanaleo.org. Click on English Language in the menu bar and then on News and Events. Scroll down to the box containing Japanese script and click on it to open a pdf file with the description. 5. Articles on Hawaiian language medium education can be viewed on the News and Events page of www.ahapunanaleo.org.